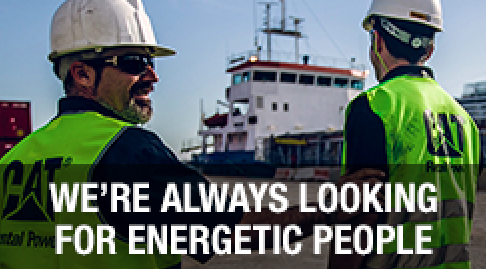 Energyst was formed by Caterpillar and 10 of its European dealers to be the exclusive CAT dealer in Europe for rental power and temperature control solutions. Energyst is represented in Europe, Latin America, Africa, the Middle East, Russia and the CIS region. We are a CAT Rental Company for power generation and temperature control. But most of all: we are a group of people that bring their personal and professional energy to every project in every part of the world. To be honest, it is not the energy of our rental solutions that makes the difference. It’s the energy of our people. Dedicated experts, who really want to know everything and assume nothing. Only then can we provide solutions that really work, today and tomorrow. As a Sales Engineer you will be responsible for business development within the Frankfurt area. You will sell Energyst rental solutions to new customers and maintain relationships with key accounts and segments that are of significant importance to Energyst. As a company with a customer intimacy strategy we are eager to serve our customer throughout Germany with the Energyst integrated Power and Temperature Control solutions. Lead the sales activity for your region, acquire prospects, expand and retain regional customers, draft proposals and negotiate and close contracts. Work in partnerships with customers in order to gain understanding of requirements and deliver best total solutions. Identify relevant lapsed accounts and potential additional accounts and implement strategy to win new business. Effectively present and represent the face of Energyst. Liaise with other members of the sales team and other technical experts in order to deliver the total solution to your customers. Act as second line on cash collection working together with sales support and accounts department. Gain understanding of the customer’s specific needs and how our turnkey solutions best fits in the context of their business. Consulting with customers to understand and anticipate their needs. Influence clients that a product or service best satisfies their needs in terms of quality, price and delivery. Self-generate sales leads within the industry through our current data management systems and active sales activity. Responsibility for CRM system for your region. Project manage your customer accounts. Good technical knowledge in electrical or mechanical engineering. Experience in Power Generation, Gas Engines or Temperature Control. Proficiency in Mathematics and English. Has excellent, influencing and relationship building skills, with all level of individuals. Proven drive and ability to sell ideas/opportunities/concepts. Commercial Awareness, with good networking skills within the industry. Ability to travel throughout Hamburg region and occasionally to other German regions with some overnight stays. A challenging and responsible job in a dynamic international organisation. We offer an attractive salary and benefits package. Please send your CV and cover letter to Sabrina.Bielars@energyst.com. For further information about this vacancy, please contact Sabrina Bielars, HR Administrator, via email.